Born in Uganda (East Africa), Sarah Ndagire, a London (UK) based singer-songwriter travels around the world sharing the culture of her homeland, ‘the pearl of Africa.’ Watching and listening the energetic Sarah Ndagire perform is like taking the most relaxing trip across Africa without a visa. She brings out the true soul of an African: the joy, sorrow, pain, determination, intelligence, and perseverance. 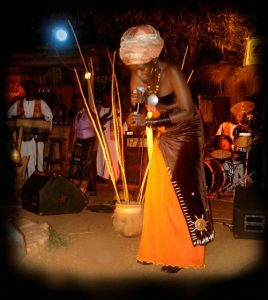 She has built an impressive repertoire made up of the most rare, unique and varied Ugandan rhythms and instruments that hitherto were played in isolation by different tribal musicians. “Her music which combines Western influences with those of her homeland has won her a loyal audience abroad, Alice Muthengi,” BBC network Africa. Following in the footsteps of internationally famous artists such as Miriam Makeba, Angelique Kidjo and Mory Kanté she continues collaborate with musicians from around the world, combining the Ugandan folk music styles with different musical styles of the world and the result has been an interesting contemporary world sound. Numerous airplays, TV appearances, CD recordings and an impressive live career make her one of the most active and sought-after female artists from Uganda today. She has performed and given workshops in different venues, festivals and schools such as Kasumama in Austria, Freudenstadt Africa festival, Forchheim Africa festival in Germany and London Africa festival at southbank London, Sullivan high school, Chicago Illinois, Chogm in Trinidad and Tobago. On the other hand, Ndagire has for a long time had a heart for and supported Older persons and the orphans and vulnerable children they live with, Gaita Uganda.